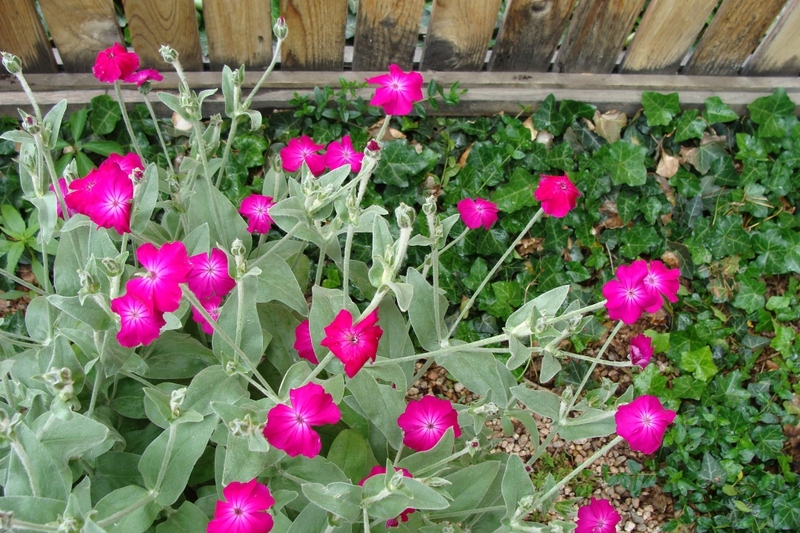 Silene (Lychnis coronaria): growing, planting, caring. 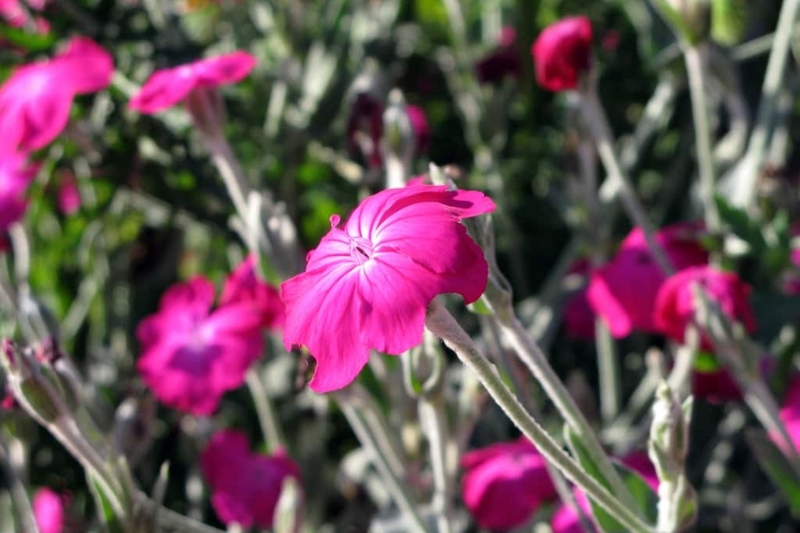 Silene coronaria - rose campion, dusty miller (but be careful, this also refers to Centaurea cineraria and Jacobaea maritima), mullein-pink, bloody William, or lamp-flower, and in the UK, - Lychnis coronaria - is a delicate pink flower with silvery foliage. The genus lychnis comprises about fifteen species, but we'll focus here on Lychnis coronaria - a plant perfect for beginners who do not want to deal with complicated timely watering. Lychnis coronaria is a perennial up to 50 to 70 cm tall, with a rather erect shape and graceful stems. Its foliage is persistent, silver gray-green, the leaves are ovate, woolly, alternate, implanted on erect stems and short side branches. Though short-lived, the plant readily self-seeds in favourable locations. The rose campion is a biennial or an ephemeral perennial of the family Caryophylaceae, such as carnations. This plant is 50 to 70 cm tall, with a rather erect habit and drooping stems. Its foliage is evergreen, silver gray-green, leaves are oval, woolly, alternate, implanted on upright stems and short lateral branches. There are also much larger basal leaves that reach 15-20 cm. The summer flowers have the shape of a trumpet with a very flat flag, and have a red-violet color. Transplant at least one month after sowing, when severe frost has passed. Choose a sunny and well drained location, even in a poor or dry soil. Dig a hole twice as large as the root ball, then put back the bottom soil. Arrange your plant at the right height in the hole, and finish flatting. Tamp well, then water. Plant in the spring or fall. Choose a sunny and well drained location, even a little poor or dry. Dig a hole twice as large as the root ball, then replace the bottom soil. Arrange your plant at the right height in the hole, and finish flatting. Tamp well, then water. In the open ground, the first month after planting, water twice a week. For potted plants, water twice a week unless the pot is outside and it has rained in the meantime! In both cases do not soak the foliage. Inside: Sow under shelter a month or two before planting outside. Use a box filled with sand and earth. Sow and bury the seeds lightly. Water twice a week until emergence. Outside: Sow in a rather dry location, not very densely on the whole area, and cover the seeds a bit. Water twice a week, until emergence. After flowering, in September or October, Time to cut some wood to give your plant a more compact shape. Also, vigilant deadheading will prolong the blooming period.